CONTEXT: Creatine monohydrate (CrM) use is highly prevalent in team sports (eg, football, lacrosse, ice hockey) and by athletes at the high school, college, professional, and recreational levels. Concerns have been raised about whether creatine use is associated with increased cramping, muscle injury, heat intolerance, and risk of dehydration. 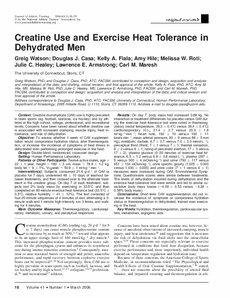 OBJECTIVE: To assess whether 1 week of CrM supplementation would compromise hydration status, alter thermoregulation, or increase the incidence of symptoms of heat illness in dehydrated men performing prolonged exercise in the heat. DESIGN: Double-blind, randomized, crossover design. SETTING: Human Performance Laboratory. PATIENTS OR OTHER PARTICIPANTS: Twelve active males, age = 22 +/- 1 year, height = 180 +/- 3 cm, mass = 78.8 +/- 1.2 kg, body fat = 9 +/- 1%, V(O2)peak = 50.9 +/- 1 ml.kg(-1).min(-1). INTERVENTION(S): Subjects consumed 21.6 g.d(-1) of CrM or placebo for 7 days, underwent 48 +/- 10 days of washout between treatments, and then crossed over to the alternate treatment in the creatine group. On day 7 of each treatment, subjects lost 2% body mass by exercising in 33.5 degrees C and then completed an 80-minute exercise heat-tolerance test (33.5 degrees C +/- 0.5 degrees C, relative humidity = 41 +/- 12%). The test consisted of four 20-minute sequences of 4 minutes of rest, alternating a 3-minute walk and 1-minute high-intensity run 3 times, and walking for 4 minutes. MAIN OUTCOME MEASURES: Thermoregulatory, cardiorespiratory, metabolic, urinary, and perceptual responses. RESULTS: On day 7, body mass had increased 0.88 kg. No interaction or treatment differences for placebo versus CrM during the exercise heat-tolerance test were noted in thermoregulatory (rectal temperature, 39.3 +/- 0.4 degrees C versus 39.4 +/- 0.4 degrees C) cardiorespiratory (Vo(2), 21.4 +/- 2.7 versus 20.0 +/- 1.8 ml.kg(-1).min(-1); heart rate, 192 +/- 10 versus 192 +/- 11 beats.min(-1); mean arterial pressure, 90 +/- 9 versus 88 +/- 5 mm Hg), metabolic (lactate, 6.7 +/- 2.7 versus 7.0 +/- 3.0 mmol.L(-1)), perceptual thirst (thirst, 7 +/- 1 versus 7 +/- 1; thermal sensation, 8 +/- 2 versus 8 +/- 1; rating of perceived exertion, 17 +/- 3 versus 17 +/- 2), plasma glucose (0-20 minutes of exercise heat-tolerance, 6.5 +/- 1.2 versus 6.8 +/- 0.8 mmol.L(-1)), plasma (297 +/- 5 versus 300 +/- 4 mOsm.kg(-1)) and urine (792 +/- 117 versus 651 +/- 134 mOsm.kg(-1)), urine specific gravity (1.025 +/- 0.003 versus 1.030 +/- 0.005) and urine color (7 +/- 1 versus 6 +/- 1) measures were increased during CrM. Environmental Symptoms Questionnaire scores were similar between treatments. The levels of dehydration incurred during dehydration and the exercise heat-tolerance test were similar and led to similar cumulative body mass losses (-4.09 +/- 0.53 versus -4.38 +/- 0.58% body mass). CONCLUSIONS: Short-term CrM supplementation did not increase the incidence of symptoms or compromise hydration status or thermoregulation in dehydrated, trained men exercising in the heat.